The weekend was pretty exciting for Justin and me. We had our offer accepted on a lake house earlier in the week, and our inspection occurred on Saturday. It was fun to see the lake house again and start planning for summer! The inspection went well - no major issues! Yippee! The house requires a bit of work to fix it up, so we are excited to start the process. Goal is to close next month and be renovated by Memorial Day! I thought the weather on Saturday was going to be much nicer, but it was such a gray day (not great for pictures). As you can see, we still had some snow on the ground (and it was still a little cold), but I am so over my boots and was wearing my leopard tuxedo flats no matter what! I feel like every time I wanted to wear them these past couple of months, we would get a ton of snow. I am bound and determined to wear them as much as possible before it is officially spring. 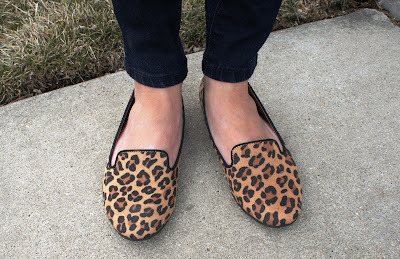 They are cute, comfortable and affordable! I tried to mix a bit of spring and winter on Saturday by pairing my new Loft sweater with my leopard flats, my fave Loft jeggings (don't judge) and a turquoise bubble necklace. I was also feeling a little nautical heading to the lake house, so the navy and cream stripes worked well. I am anxiously awaiting this super cute anchor skirt from J.Crew Factory to show up on my doorstop! I think I am even more obsessed with anchors now that we are lake house bound. As I am sure you can tell, I love a good arm party. I have only recently gotten comfortable with a stacked wrist, but now I am obsessed. I am jewelry-obsessed in general these days, though. 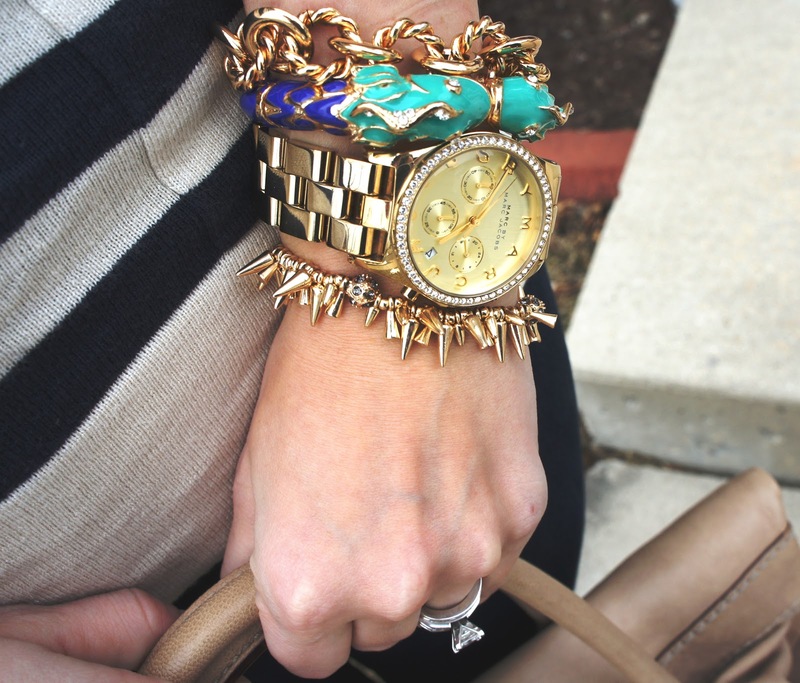 Accessories can completely transform an outfit, and usually at a low cost. I felt that the Target fish bangle was a necessity for visiting the lake house. Of course, I incorporated a few of my favorite staples as well. I love how these bracelets mix and match so well. Two of my other favorite staples are my Hello Fab Diamonds and Bows ring and my Kate Spade Spence Convertible Satchel that I scored on Gilt a couple of years ago at major discount. 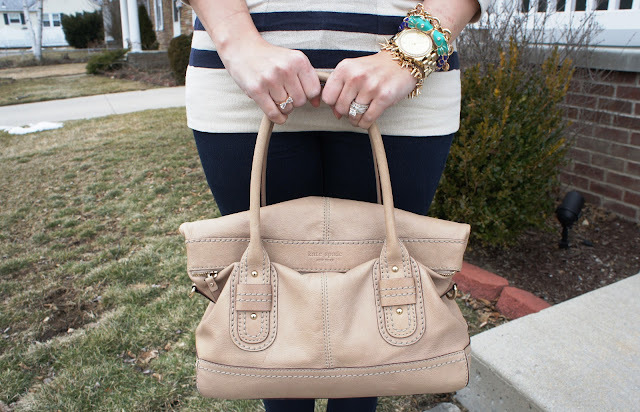 I wear my bow ring almost daily and carry the Kate Spade satchel quite a bit during the spring and summer. The lake house purchase and renovation is obviously very exciting, but it will also require some changes in our budget. Luckily, I have already purchased quite a bit of spring clothing, and I have a ridiculous amount of bathing suits that I purchased for our honeymoon last year! In all seriousness though, I do try hard to find the best deals and find the balance between the J.Crew style and the more affordable items. I think I will be okay. I just may have to buy a little less and do a bit of a closet remix challenge every once in awhile, as inspired by my many Instagram friends. I plan to blog throughout the process and will keep you posted on how I am keeping to my fashion budget. All that can wait until AFTER my Ireland/Scotland trip though! I still cannot believe we are in the process of purchasing a lake house. 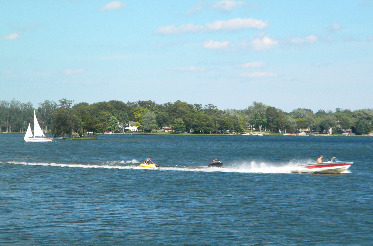 I cannot wait for the Fourth of July fireworks on the lake, the Lobster Fest and all the other fun summer activities! It is not even spring yet, and I am dreaming of summer. I need to slow down a bit! What are you most looking forward to for spring and/or summer? Aww, thanks, Kelly! It was a quick snap of some photos, but I am excited to finally have an outfit post! It's the little things, haha. I feel the same way about bubble necklaces, especially my turquoise one. That is so exciting that your fiancé's parents are building a lake house! Summer is going to be such a blast! 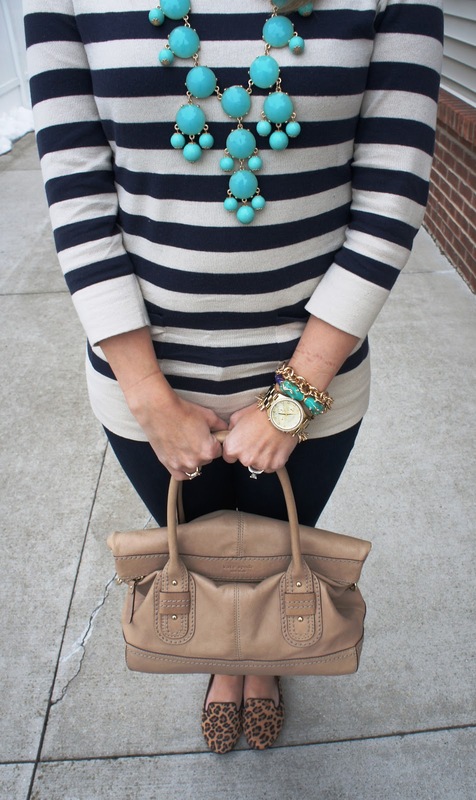 Love the stripes and leopard combination. I love bubble necklaces too! Great pop of color! Congrats on the lake house. Jealous! Thanks, Jill! I think I am going to take a break from shopping. I have a bunch of great staple items for spring now, and I think if I shop my own closet, I will find a ton of great new outfits! You've inspired me! Great outfit! I love the shoes!! Target just came to Canada, hopefully I can find those flats!! Newest follower, would love if you could visit my blog! !